Autumn is quickly approaching, and in many areas, the water clears up in the fall. This is due to several things within the ecosystem, but the reality is, autumn waters can be clearer, and that will affect how we the fish react. And how the fish react should have an impact on how we react to our fishing presentations. I’ve got a trip planned to visit Sturgeon Bay of Door County in Wisconsin this fall. In planning for this trip, I refer back to a trip I made there in the fall a couple of years ago. Door County is a peninsula north of Green Bay in extreme eastern Wisconsin and is known for its ultra-clear water: When ice-fishing you can see bottom in almost fifty feet of water. That’s clear stuff, and it requires special fishing considerations if you want to be successful. On this particular trip we started out fishing for walleyes. Much of the time we think of walleyes to be bottom-hugging fish, and in many bodies of water they are. But walleyes are hungry in the summer and fall, so they’ll be wherever the baitfish are. Around Door County, the baitfish suspend, and the walleyes do the same. At times they’ll be just a few feet below the surface. On this day on the water, we employed a trolling presentation that’s very refined and that enabled us to keep our spinner rigs where the walleyes were. We used planer boards with Off Shore snap-weights. We set out three lines on each side of the boat. The outside lines had the lightest weights, so those rigs were running closest to the surface. The lines closest to the boat had the heaviest weight. This meant that the lines closest to the boat were running the deepest. We were covering three different depths on each side of the boat. In this exceptionally clear water, most of the walleyes bit on the line farthest away from the boat. We were using Off Shore in-line planer boards with Tattle flags, so the boards were easy to read even when they were a good distance from the boat. By employing this technique, we caught good numbers of walleyes, and some big ones. Later in the day we got after smallmouth bass. They were in four to six feet of water. We saw several swimming near the boat, but they wouldn’t eat our bait. We started making long casts and started catching smallmouth, nice ones, very regularly. They wouldn’t eat our baits when they were close to the boat, but if they saw it when it was a good distance away from the boat, they ate it willingly. Many of the biggest bass bit as soon as the bait hit the water at the end of a very long cast. This is when a no-stretch line like P-Line XTCB Braid can be a huge benefit. You get much better hooksets when the line doesn’t stretch. Some anglers like to tie a fluorocarbon leader to the braid. They believe this makes the presentation more appealing to the fish, as the fluorocarbon attached to your lure is less visible than the braid. Tie a two foot leader of eight pound test Tactical Fluorocarbon to your braid and see if the strikes increase. You can catch lots of fish, and big fish, in clear water if you employ techniques that minimize the effects of the clear water. Fish have to eat regardless of water color. Keep the above ideas in mind and you’ll catch more fish when the water is clear. 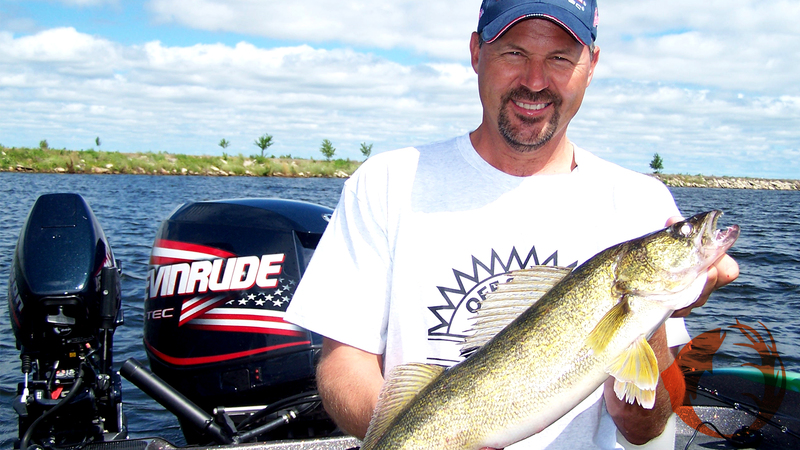 Photo: Dean Arnoldussen is one of the best anglers anywhere at catching suspended walleyes. This one was suspended down seventeen feet over thirty feet of water.